Award winning Magnum photographer Chris Steele-Perkins unflinchingly records the absurdities, the pleasures and the tragedies of English life, invariably with wit and humour. 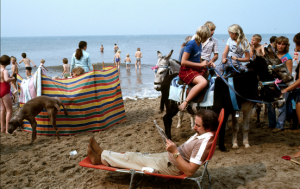 There is a certain pathos in the image of a crowded beach, complete with donkeys, in which an unobserved dog pisses upon a windbreak: the English are unbelievably stoical holidaymakers. He would resist being called a cultural anthropologist but “all human life is here” as well as the illusions that propel it. One can move from an amazing shot of obese male strippers, The Blobendales, to one of a Brixton Reggae Festival where inexplicably, the entire Afro-Caribbean audience looks glum; or to a group of “blissed out” Children of Jesus. His stance is nonjudgmental or, more precisely, of Dickensian largesse, but his preoccupation with the truth about England, brilliantly captured, means perhaps that he really loves it, warts and all. Catch England my England at the Kings Place Gallery from 18 June – 30 July 2010. This entry was posted in EXHIBITIONS and tagged Brixton Reggae Festival, Chris Steele-Perkins, Kings Place Gallery, Magnum photographer. Bookmark the permalink.